This page describes the divine roles and functions of the god--including fire, smiths and craftsmen, volcanoes and his identification with foreign gods. Hephaistos was the god of fire, and often his name was used as a synonym for the element. "[The men] pitted the vitals and held them [to cook] over the flame of Hephaistos." "Swine with the fat abundant upon them were singed and stretched out across the flame of Hephaistos." "Looking like the flame of Hephaistos, weariless." "[Sacrificial animals were] stretched out across the flame of Hephaistos." "When the flame of Hephaistos had consumed you [the dead man on the funeral pyre]." "Tin melts when heated by men's art in channelled crucibles; or as iron, which is hardest of all things, is softened by glowing fire in mountain glens and melts in the divine earth through the strength of Hephaistos." "The strength of glorious (klytos) Hephaistos was beginning to kindle the [sacrificial] fire." "Hephaistos [i.e. as the fire of the beacons], from Ida speeding forth his brilliant blaze. Beacon passed beacon on to us by courier-flame: Ida, to the Hermaean crag in Lemnos; to the mighty blaze upon the island succeeded, third, the summit of Athos sacred to Zeus." "[Kratos to Hephaistos:] Your own flower, flashing fire, source of all arts, he [Prometheus] has purloined and bestowed upon mortal creatures . . . Why do you not detest a god most hateful to the gods, since he has betrayed your prerogative [fire] to mortals?" "Here, you there, take all these weapons and hang them up inside close to the fire, near the figure of the god who presides there and under his protection." "As a cauldron on Hephaistos' hearth maddens with ceaseless hissing o'er the flames from blazing billets coiling round its sides." "The hot flesh of the swine whereon the red breath of Hephaistos beat." "The flames gave back before him everywhere: the blast of Hephaistos' breath." "Hephaistos purest flame of fire [at the wedding of Peleus and Thetis for the cooking of the feast]." "Strong, mighty Hephaistos, bearing splendid light, unwearied fire, with flaming torrents bright: strong-handed, deathless, and of art divine, pure element, a portion of the world is thine: all-taming artist, all-diffusive power, 'tis thine, supreme, all substance to devour: aither, sun, moon, and stars, light pure and clear, for these thy lucid parts [of fire] to men appear. To thee all dwellings, cities, tribes belong, [fire] diffused through mortal bodies, rich and strong." Sokrates : Let us inquire what thought men had in giving them [the gods] their names . . . The first men who gave names [to the gods] were no ordinary persons, but high thinkers and great talkers . 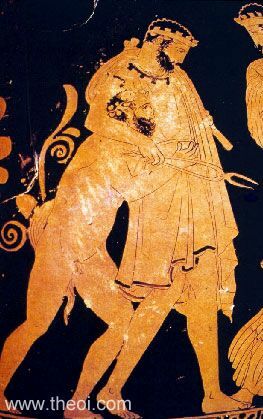 . .
Hermogenes : But surely you, as an Athenian, will not forget Athena, nor Hephaistos and Ares . . . And how do you explain Hephaistos? Sokrates : You ask about ‘the noble master of light’? . . . Hephaistos is Phaistos, with the eta added by attraction; anyone could see that, I should think." "Whatever parts the flames could ravage Mulciber [Hephaistos] had removed." "The selfsame god [Hephaistos] had armed him [Akhilleus] and consumed him in the end [on the pyre]." "[The witch Medea employs various fabulous ingredients in a spell to create magical fire :] Mulciber [Hephaistos] hath also given me fires which subtly lurk in sulphur." "Hephaistos : The god and fire." "As when a man adds gold to a silver vessel, a craftsman taught by Hephaistos and Athene to master his art through all its range, so that everything that he makes is beautiful." "Iron, though that is the strongest substance, melts under stress of blazing fire in the mountain forests worked by handicraft of Hephaistos inside the divine earth." "Hephaistos famed for inventions (klytometis). With bright-eyed Athene he taught men glorious crafts throughout the world,--men who before used to dwell caves in the mountains like wild beasts. But now that they have learned crafts through Hephaistos the famed worker (klytotekhnes), easily they live a peaceful life in their own houses the whole year round." "[One] who has learned the works of Athena and Hephaistos Polytekhnes (the god of many crafts) gathers in his livelihood with his hands." "Hephaistos had given him [Polytekhnos] an axe for his work as a carpenter." "[Sokrates, as the son of an Athenian potter, traces his ancestry back to the mythical artisan Daidalos and the god Hephaistos :] `Mine [goes back] to Daidalos, and Daidalos to Hephaistos, son of Zeus!" "The appointed hour was approaching when man in his turn was to go forth into the light of day; and Prometheus, not knowing how he could devise his salvation, stole the mechanical arts of Hephaistos and Athene, and fire with them (they could neither have been acquired nor used without fire), and gave them to man . 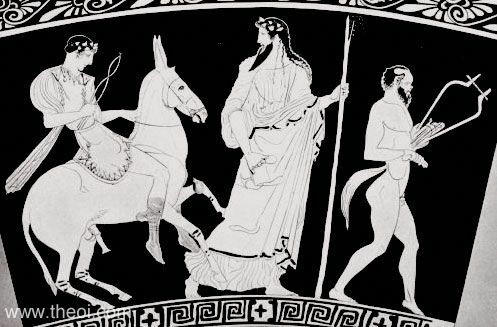 . . he entered by stealth into the common workshop of Athene and Hephaistos, in which they used to practise their favourite arts, and carried off Hephaistos' art of working by fire, and also the art of Athene, and gave them to man. And in this way man was supplied with the means of life." "Hephaistos and Athene, who were brother and sister, and sprang from the same father, having a common nature, and being united also in the love of philosophy and art, both obtained as their common portion this land [Athens]." "[From a description of an ancient Greek painting adorned with gemstones :] What abundance of sardonyx, of emeralds, adorns them, and the pearls are true pearls; but the workmanship must be attributed to Hephaistos!" "Khalkeia (Bronzes) : An ancient and popular festival long ago, but subsequently observed by the craftsmen only, because Hephaistos [first] worked bronze in Attika." "Khalkeia (Bronzes) : An Athenian festival . . . for craftsmen in general and bronze-smiths in particular, as Apollonios says . . . the festival is celebrated . . . for Hephaistos." "Lampados (Of a torch). And with torches. Athenians celebrate three torch-festivals, at [the] Panathenaia, Hephaistia and Promethia. Istros says that having a torch-race was something [the] Athenians first did when sacrificing to Hephaistos, to commemorate him who grasped the use of fire and taught it to others." "Aithaloeis theos (Sooty god) : Hephaistos, since [he is a] blacksmith. The same [god] is called Klutotekhnes (famed-for-craft), since his skill at smithy-work is renowned." Hephaistos was later identified with the Italian volcano-god Adranus-Volcanus, and came to be regarded as the god of volcanoes. Originally the Greeks associated volcanic activity with the Gigante-sons of Gaia, rather than with Hephaistos. "Korykia's ridge [in Lykia], and that great rock of the wise Fire-god [Hephaistos], marvellous in men's eyes; for thereon, nightlong, daylong, unto him fire blazes, tireless and unquenchable [the Lykian volcano Mt Khimaira]. Laden with fruit around it palm-trees grow, while mid the stones fire plays about their roots. Gods' work is this, a wonder to all time." "Immediately above the city [of Baiae in Italia] lies the Forum of Hephaistos [Forum Volcania], a plain shut in all round by exceedingly hot ridges, which in numerous places have fumaroles that are like chimneys and that have rather noisome smell; and the plain is full of drifted sulphur." "Between Lipara and Sikelia (Sicily) is [the island of] Thermessa, which is now called Hiera of Hephaistos [or Volcanus in Latin]; the whole island is rocky, desert, and fiery, and it has three fire blasts, rising from three openings which one might call craters. From the largest the flames carry up also red-hot masses, which have already choked up a considerable part of the Strait." 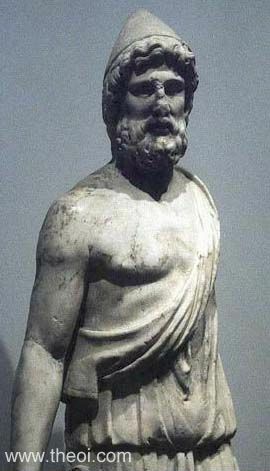 Hephaistos was identified with the Egyptian god Ptah and the Italian god Volcanos-Adranos. "Typhon . . . felt an urge to usurp the rule of Zeus and not one of the gods could withstand him as he attacked. In panic they fled to Aigyptos (Egypt) . . . When they fled they had changed themselves in anticipation into animal forms . . . Hephaistos [became] an ox [i.e. the Egyptian god Ptah]." "I also heard other things at Memphis [in Egypt] in conversation with the priests of Hephaistos [i.e. the Egyptian god Ptah]." "Built in it [Memphis in Egypt is a] . . . great and most noteworthy temple of Hephaistos [i.e. the Egyptian god Ptah]." "Volcanus [Hephaistos] has different names in Italy, in Africa and in Spain." "There are also several Volcanos' [Hephaistos']; the first, the son of Caelus [Ouranos], was reputedly the father by Minerva [Athena] of the Apollo [Erikhthonios] said by the ancient historians to be the tutelary deity of Athens; the second, the son of the Nile, is named by the Egyptians Phthas [Ptah], and is deemed the guardian of Egypt; the third is the son of the third Jupiter [Zeus] and of Juno [Hera], and is fabled to have been the master of a smithy at Lemnos; the fourth [the Italian god Adranus-Volcanus] is the son of Memalius, and lord of the islands near Sicily which used to be named the Isles of Volcanus [the Lipari islands]." "Phthas : Hephaistos in Memphis." Greek Elegaic Solon, Fragments - Greek Elegaic C6th B.C. Plato, Alcibiades - Greek Philosophy C4th B.C. Plato, Critias - Greek Philosophy C4th B.C. Plato, Protagoras - Greek Philosophy C4th B.C.